Replacement Water Inlet Valve and Float for Hydrofoggers & Minifoggers.� Simple Push-To-Connect Water Inlet.� Please note new Water Inlet Valve only sold in combination with New Reservoir Pan.� (New Reservoir Pan included). Update older Hydrofoggers and Minifoggers to the new Water Inlet Valve and Float. The new design is fully integrated and eliminates the need for the old brass connector. Kit comes installed with a new Reservoir Pan as the new assembly will not fit in older pans. 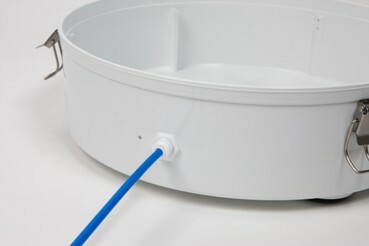 Simply cut or detach tubing from old reservoir pan, unbuckle pan, and replace with new pan. Tubing then pushes to connect in new Water Inlet. (New units come fitted already with this float valve). Please note old water inlet and float is no longer available.